While visiting Stonehenge I enjoyed seeing all the scenery including the clouds above. It added an eerie feeling while visiting the ancient site. This entry was posted in Travel, Travel Photos and tagged Clouds, England, English Landmarks, Nature, Photography, Photos, Sky, Stonehenge, Travel, Travel Blog, Travel Journal, Travel Photos. Bookmark the permalink. Oooooh, I love cloud pics! That’s a great shot. It’s funny, I was sitting outside today looking up at the clouds thinking that I should go and get my camera, but I was so relaxed (which was much needed) that I couldn’t get up! LOL. Oh well, next time. I think you made the right decision considering your week. I’m happy to hear you sat there and relaxed. I hope your son is starting to feel better! Yes, it does add some mystery and drama to already mysterious rock formations. Nice shot! Thanks! I loved the extra drama. BEAUTIFUL! Look at the plane captured in the clouds. Some of my best moments while flying were when I could look out the window and see the beautiful clouds. Clouds above, clouds below, at the seat of heaven I stow. I also love that feeling. It is like the plane is floating and I feel more secure. When I took the picture, I didn’t see the plane. It was a pleasant surprise. Don’t worry, I didn’t see when I was snapping the photo. Nice shot. The small plane really adds the spice to the photograph. I like reading and visiting your blog so I did the creepy thing and blog rolled ya. Thanks Nate. Over the past few weeks I’ve been updating my blog roll as well. I enjoy your blog and I’ve added yours. I hope the little redhead is a happy clam! It does look like he wants to go unnoticed. Have you looked at Constable’s cloud studies? I don’t think I have. I’ll have to check out his paintings. Thanks for the tip! Great shot! 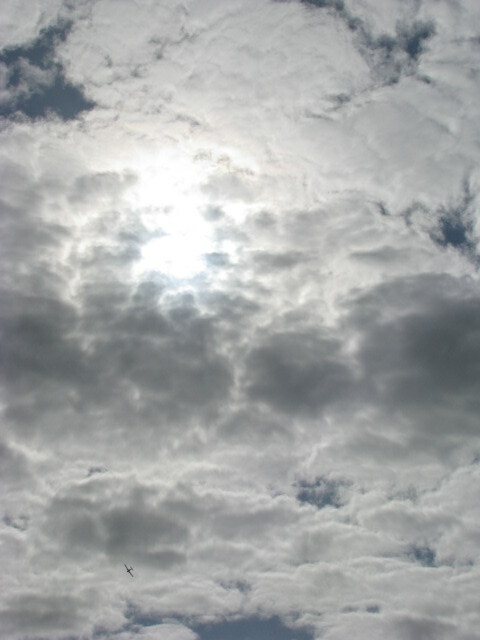 When I want to realax a bit I usually look up at the sky as it turns me in a good mood even when it’s cloudy! I’m the same way. I can be in a horrible mood and then I’ll set outside and see the sky and I feel at peace. Hi there TBM, this post reminded me of Fats, one of the ladies in GatheringBooks – she’s the one based in San Diego. She has a collection of cloud photos and on occasion she posts it as well. Your photo looks like an entire bed of fluff, just lovely. Ah San Diego is one of my favorite cities! I’m jealous of Fats. Such a lovely town and the beach is fantastic! The sky is truly NOT the limit! A nice philosophy for life Hook!